Just ask Tim Ferriss, he's an author, motivational speaker, + business guru who wrote books on how to maximize productivity in work, nutrition, and fitness. And it all starts with your morning routine. But one thing he doesn't talk about, how how to Maximize Your Connection to Your Spouse. When I first heard about Tim Ferriss, I had just signed up for a 12 month business coaching program. I was ready to create a private psychotherapy practice that flourished so that I could help as many couples learn to master the messiness of couplehood, as possible. I won't bore you with the details, but as a solo business owner, I dove in. I recorded (an absurd amount) of video blogs. I tracked my website traffic. I wrote + rewrote content for my website. I did all things social media. And much, much more. And what I learned from this dude Tim Ferriss, was that how I started my day deeply impacted the rest of my day. My energy. My focus. My mood. And most importantly (for my business) my productivity. And he was right. I implemented some of the most simple, yet powerful tools to skyrocket my productivity in my business. But then I started noticing something. I was neglecting my own marriage! The Happy Couple Expert ... the biggest #LoveGeek around, was actually SUCKING at connecting with my spouse. And I knew I had to do something about it. So I came up with my own Morning Routine to Maximize Connection. Are you and your spouse coffee drinkers? Take time to ask your partner what their fave flavor of coffee is, if they have a fave creamer or syrup. And set up the coffee maker, and all the fixens the night before. Thoughtfully choose the mugs you two will use. Set them out with the intention that tomorrow morning is all yours. (Not coffee drinkers? That's ok ... get an array of teas, fave breakfast foods, or some sort of food or beverage that can be quickly prepped + enjoyed early in the morning. TOGETHER. 😉). Step 2: Wake up... a little (or a lot) early. For some of you, this may be a really BIG ask. You may have little ones that kept you up all night, + require your attention early in the morning. Others may only be able to hit the gym if the house is left by 4am. Or perhaps you just are NOT a morning person. I get it. But I want you to make an attempt at least ONCE this week. Can you carve out an extra 30 minutes? Set your alarm, and just do it. Like Mel Robbins says, use the "5-4-3-2-1 GO!" strategy and launch outta bed the FIRST time your alarm goes off. Step 3: Talk, connect, cuddle ... nothing fancy. This is where keeping things simple, light + easy comes into play. This isn't the time to talk about irritating logistics of the day + how you already know your partner is going to not meet your expectations today. Nope. Not the time. So table it. There will be plenty of time to talk about that. This is time to just sit quietly. Together. Maybe hold hands. Sip coffee. Can you just take in the sunrise with your partner? I personally like to put music on really low ('Chill Out' radio on Pandora if you were looking for ideas) + just snuggle up with my husband. Sometimes we chat about meetings he has that day. Or how many clients I'm seeing + when I will be home. Other times, I get lost in the silence. Tracing the outline of his fingers or twisting his wedding ring on his finger. We just take the time to slow down + connect. Even if we went to bed irritated with one another, our morning coffee is a chance to recalibrate. If we need to revisit + repair last night's fight, we know we will ... later. In that moment, in the morning it's time to connect. Quietly. Softly. Quickly. Purposefully. This isn't something we've always done. It's something that was created out of necessity. It was simple. It was not super convenient. But it was a little tweak we made to create connection that had been slipping away due to our focus being on so many things other than US. So, if you find your connection slipping + you're ready to up your morning routine game, try this out. If you can do 30 minutes a day, 5 days a week - awesome!!! If you can manage 15 minutes once a week - good. Just start somewhere. 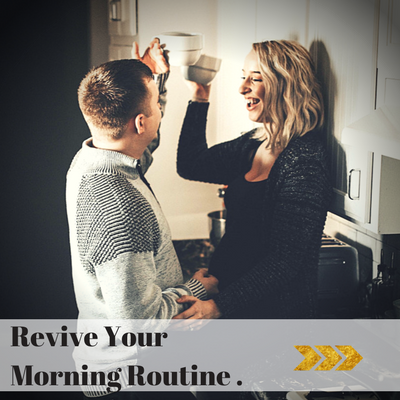 Know that your morning routine sets the tone for your day, your mood, + your energy. So, slow down + connect with your partner. You both deserve it. And if you are totally on board with this concept but are struggling to figure out how to implement this, (or how to get your partner on board) click the button below + let's chat! For ideas to on how to be more productive, check out Tim Ferriss's suggestions. They rock!